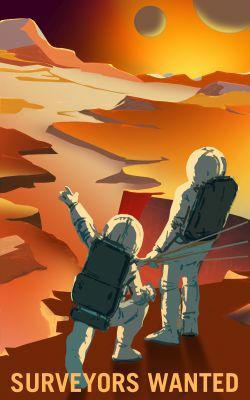 Mars Colonization: Mars Needs Surveyors! Elon Musk’s plan to make us a space-faring and multi-planetary species will provide another planet to survey. Late last month, SpaceX’s founder Elon Musk unveiled his plan to start Mars colonization by 2025. Musk believes passionately that for humankind to survive in the long run, we must become a space-faring and multi-planetary species. Sooner or later, Earth will encounter its sixth extinction event, and humans will cease to exist. That’s right; Earth has had five previous extinction events, with the most recent being the K/T event when an asteroid or comet 10 kilometers in diameter smacked into the Yucatan Peninsula and put an end to the dinosaurs. The sixth extinction event could be caused by nature (asteroids, comets, volcanoes, or a global plague) or man (nuclear/biological/chemical warfare or extreme environmental degradation). Most experts agree: it’s a matter of when, not if. So let’s move towards off-world colonization, argues Musk, with his audacious plan to build a fleet of huge, reusable rockets capable of carrying 100 passengers at a time to the red planet. You can watch Musk’s presentation at the 2016 International Astronautical Congress. While it may be a brash plan—many observers think his 2025 timeline is wildly optimistic—it does get people excited and thinking about the possibilities. There are many challenges to be overcome, especially human factors like the dangers of radiation and life in zero gravity. Some of these challenges will be mitigated by compressing the travel time to Mars from the usually-quoted six months to less than three, and thus halving the exposure time to these hazards. Naturally, there are financial factors, as well. In the long run Musk’s plan would bring the per-person ticket to Mars cost to around $200,000. Getting to that point will entail huge costs associated with design, development, and production of a wide range of items. Musk is counting on SpaceX’s lucrative satellite launch business, along with sponsorships and crowdfunding, to help foot the bill. Eventually Musk sees a million-person colony on Mars. Making the Mars colony pay its own way is yet another issue, one that may well bring the remote sensing and geospatial profession into the mix. Read part two next time to find out more.